A cat condo gives comfort, protection, and fun to your well-loved felines. It serves as their personal space. This gives your cats area for hiding when they want to avoid interaction or if they feel threatened. With so many options available on the market, finding the best cat condo may be a bit challenging. Hence, below are the three cat condos that your frisky pet will surely love. The board material is made up of wood that is strong enough to withstand your active cat’s movements. It is covered with faux fur to give comfort and act as a good resting spot for your cats. Each of the posts is covered with natural sisal rope for good grip. It also serves as a scratcher giving your cat better shredding. The cat tree condo comes in a solid base and sturdy posts. It has a big-sized and a small-sized condo to allow your flimsy cats to enjoy. 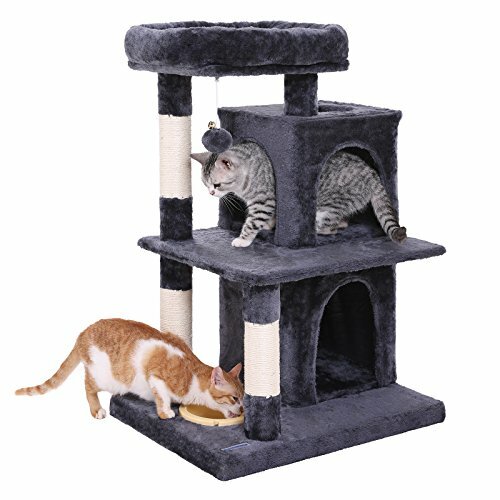 The two nicely cushioned perches greatly help your cat to climb to higher heights. 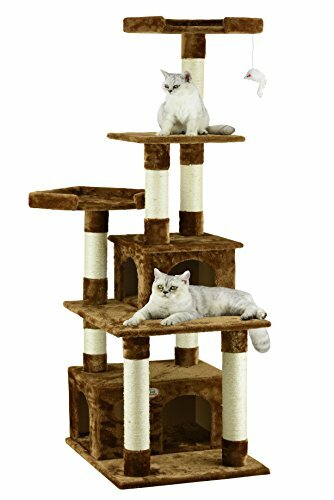 Additionally, the Go Pet Club cat tree condo comes with three different color options: black, brown, and beige. This cat furniture comes with helpful step-by-step assembling instructions. Tools are included in the package, too. The product is highly competitive for its price. Assistance from helpful and knowledgeable staffs is highly commendable. Lastly, the manufacturer offers free delivery and replacement of the parts for a limited period only. The cat tree condo has two large and perfectly cushioned platforms with raised edging to allow your cats to sit and look out of the window. It also comes with two spacious and roomy hideaway houses for better lounging and sleeping. The sisal posts are designed for scratching and preventing your cats from clawing. A cozy hammock and interactive jingly balls are also present for your cat’s fun and enjoyment. 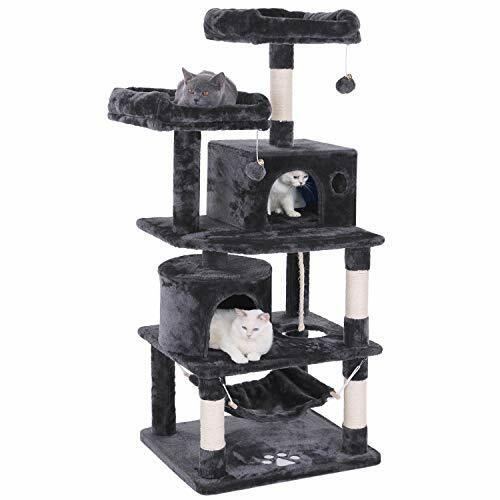 The several layers of this cat tree condo are perfect for climbing up and down both for your big or small cats. Cats can easily and safely jump on and off the cat tree condo due to its super solid construction. It has a strong base and a well-balanced design that adds to its overall durability. There is also a wall anchor strap available for added stability especially if multiple cats are using the condo. The entire cat tree condo is made up of high-quality plush material. These soft and comfortable coverings give your cat better experience in exploring and sniffing around. Problems with furniture scratching will surely be lessened. The attractive design will surely compliment your home. It comes with an easy-assembly feature with hardware and tools included in the package. The cat condo is compact in structure but comes with two roomy condos for your pets to live and play. It has a thickened baseboard with 2-tier battens that remain stable and prevent shaking. You can secure the structure to the wall through its anti-toppling fittings. This cozy cat condo allows your pet to play, jump, and take a nap with ease and comfort. It has a feeder bowl located at the bottom platform for easy and convenient switching between feeding and playing. There is a top perch equipped with a padded raised edge to give your cat a better lounging experience. Cats can also enjoy their bed and nap peacefully. The particle board is made from premium and high-density construction for more durability and overall stability especially during jumping around of your cat. It’s supporting tubes features compressed and glued cardboard that can firmly hold the platform without wobbling. A strong and natural sisal rope is used on each tube to withstand constant scratches and to satisfy the instincts of your cat. The manufacturer provides the customers professional and friendly customer service before and after purchase. After the evaluation of the products included in our best cat condo list, a decision has been made as to which is the best among the three. The Bewishome Cat Tree Condo is a great option to provide a relaxing and playing area for your well-loved cats. It may be on the expensive side but is definitely worth it, given its remarkable structure, highly functional design, and extreme comfort and safety that it will give your feline friends. Both Go Pet Club F206 Cat Tree Condo and Songmics Multi-Level Cat Tree with Feeder Bowl make a good cat tree condo too. However, they are limited in features that will provide for a more enjoyable frisky cat experience.